Research indicates the long-term horse contraceptive, porcine zona pellucida (PZP), extends the breeding season in wild horses, raising concerns over the social consequences of the drug on herds. PZP, which is derived from pig eggs, is increasingly being used in wild horse herds in the United States in a bid to slow down the growth in numbers. Research published in the open-access journal, PLos ONE, reported on a study of wild horses living on Shackleford Banks, in North Carolina, covering four years before contraceptive management to eight years after contraceptive management with PZP. The Princeton University researchers studied the foaling data, and found that since the contraception programme began in January 2000, foaling has occurred over a significantly broader range than it had before the programme. "For a gregarious species such as the horse, the extension of reproductive cycling into the fall [autumn] months has important social consequences, including decreased group stability and the extension of male reproductive behaviour," the researchers wrote. "In addition, reproductive cycling into the fall months could have long-term effects on foal survivorship. "Managers should consider these factors before enacting immunocontraceptive programmes in new populations. We suggest minor alterations to management strategies to help alleviate such unintended effects in new populations." The authors noted that while physiological effects of PZP had been well studied in horses, little was known about PZP's effects on the scheduling of reproductive cycling. They said recent behavioural research had suggested that horses receiving PZP extended the receptive breeding period into what is normally the non-breeding season. Their research into the Shackleford horses suggested this was the case. Their study data centred around 65 births from 45 mares in the four years before PZP's use by the National Park Service on the Shackleford horses, and 65 births from 45 mares following its use. The researchers, Cassandra Nuñez, James Adelman and Daniel Rubenstein, from the university's Department of Ecology and Evolutionary Biology, noted that immunocontraceptive management has become increasingly popular as culling programmes were seldom well-received by the general public. In wild horse societies, the harem is the core social group, consisting of usually one, but sometimes two or three harem males, one or several females, and their offspring. Harem males will sometimes fight to acquire mares from other groups, but stallions almost always retain their mares. In temperate environments, food availability is lower during the fall and winter months and free-ranging horses will alter their activity to maximise food intake and reduce energy costs. Mares are typically not ovulating at this time and sexual behaviour in males is largely absent. "On Shackleford Banks, increased reproductive behaviour in the post-breeding season by mares has resulted in increased male attentiveness," the authors noted. "Such behaviour (by males) has been shown to restrict the movement of females, thus reducing their grazing efficiency. "The occurrence of this behaviour during a time of year when animals typically increase group spread to acquire adequate forage, represents a change in behaviour fundamental to the animals' survival," the researchers said. "Offspring conceived during the post-breeding season are likely subject to decreased resource availability as lower quality forage can affect mares' ability to produce sufficient milk." The researchers said breeding in the Shackleford herd normally occurred from March through August, with most births occurring in April and May. "After contraception management, foaling occurred over a broader range of months than before contraception management," they noted. On average, current PZP recipients gave birth 3.36 months later than did pre-contraception mares. Mares that had received PZP earlier in their lifetime, but not during the year of conception (prior recipients), gave birth 0.90 months later than pre-contraception mares on average. Non-recipient mares that never received PZP themselves, but gave birth after the general population was managed with PZP, gave birth 1.01 months later than pre-contraception mares on average. This translated into current PZP recipients giving birth 2.34 months later than non-recipient animals and 2.46 months later than prior recipients. "This study provides the first evidence that mares treated with PZP can extend ovulatory cycling beyond the normal breeding season. "This suggests that populations of wild ungulates can vary in their response to similar contraceptive treatment. Careful consideration of baseline population dynamics should be made prior to treatment in order to fully assess possible PZP effects." They continued: "Because feral horses are highly social, such changes can have cascading effects on other group members and throughout the population. "Our research has shown that after contraception management, PZP recipients both attract and initiate more instances of reproductive behaviour and are more often the harem male's nearest neighbour during the fall/winter, indicating that group spreads are reduced. "Such changes represent an increase in energy expenditure and a potential decrease in nutrient intake during a time of year when sufficient energy reserves are at a premium. "Moreover, early foal development in unmanaged populations typically occurs during the spring and summer when resources are plentiful. Offspring born in the fall/winter months face nutritional and thermoregulatory challenges not experienced by their counterparts born during the normal foaling season, potentially making developmental benchmarks difficult to achieve." 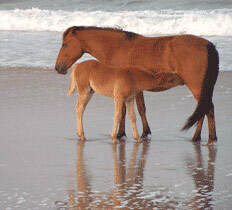 They noted that such predictions are not consistent with data from Assateague Island, where a study of mares showed increased survival, only minimal physiological side effects, and no behavioural or demographic changes. "In addition, foal survival does not differ between foals born in or out of the normal foaling season. 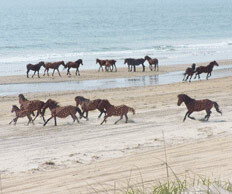 However, on Shackleford Banks, recipient mares change groups more often, elicit and receive more instances of reproductive behaviour, and receive more harassment from harem males. "Given these differences in mare response to PZP management in the two populations, it follows that predictions based on the data from one site are not necessarily applicable to the other. "These population differences may be due to the scheduling of PZP administration at the two sites. "When the contraception programme on Assateague began in 1994, the priorities for treatment followed a hierarchical approach based on the previous breeding success of the population, ensuring that all mares were given an opportunity to reproduce." This was not the case with the Shackleford herd. This, and other differences noted by the authors, may have contributed to the behavioural differences between the populations, as the ability to conceive with a harem male is likely critical to establishing lasting harem fidelity, and the retention of foals until at least two years of age is important to maintaining normal reproductive function. "When the alternative (gather and removal) is considered, PZP is currently managers' most humane and effective option for population control," they said. "However, careful study of the animals' demography, physiology, and behaviour is necessary prior to and during treatment to ensure that a) the potential effects of PZP can be assessed accurately, and b) within managerial constraints, unintended effects of PZP are ameliorated. "Differences in habitat, resource availability, and demography among conspecific populations will undoubtedly affect their physiological and behavioural responses to PZP contraception, and need to be considered." "The broader implications of this research are considerable. As this study suggests, the physiological and behavioural effects of PZP are not fully understood. "For social species like the horse, a proper balance between managing population size and maintaining a more natural physiological and behavioral regime is particularly important."